I don't bother much about birthdays to be honest. I did enjoy this one though. Philip, bless him, remembered me mentioning a perfume I like, months ago. He bought me the perfume and body lotions etc. I was really impressed. I didn't expect him to think of it and I hadn't mentioned it since. He also got me a gold chain for my pendant so I can wear that again, a lovely Christmas decoration (that I will love putting out) and a couple of nice brandy glasses. Then there was this box. It came through the mail. It was from England. I didn't read who it was from as I didn't want to see the customs declaration and spoil the surprise. There is an old friend I worked with many years ago who still keeps in touch with me. We were both employed at the same school......or "The factory" as he used to call it. Over the last few weeks I had been bemoaning the lack of daffodils, or any Spring flowers come to that, here in Wisconsin. We don't generally send each other birthday gifts...just a card maybe so I wasn't expecting it to be from him. He had made the whole thing himself (except for the flowers) it came in pieces with 'self assembly' instructions. You can't really see in the picture but there is a little fence made out of sticks of wood, some inscribed "Acme Fencing Co."
The sunflowers at the back are stuck into corks which are then stuck into little coffee creamer pots - to look like flower pots. He should have had a job on Blue Peter. Bless him. It quite made the whole day perfect......well that and going out to Red Lobster to eat. Thank you to all my chums on Facebook who sent me birthday wishes. Facebook is really useful for things like this. A very simple way of keeping in touch. The Gob is pants. Tongue, roof of mouth and sometimes even lips sore and burning. A foul taste in the mouth that spoils everything I eat. Sometimes it is worse than others but it is driving me to distraction. I have an appointment with my doctor tomorrow. I hope this turns out well and there is something that can ease it. I hope it isn't another round of expensive tests just to be told I have to put up with it. Just noticed....you can see all the snow we STILL have through the window. Now you can understand why we don't get any Spring flowers. 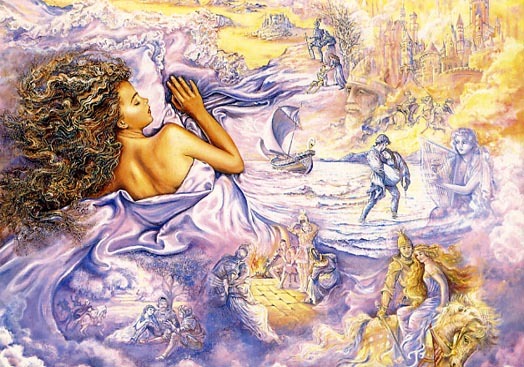 I also have very weird dreams. I wonder if everyone does? Philip rarely remembers his dreams. I have a recurring dream about a house. I know this house very well but there are some rooms in it that terrify me. Sometimes I will venture into one but it is a very uncomfortable feeling. Mostly, I just rush past the doors to these rooms, never even stopping. The house is generally in bad repair. Every room needs decorating. Sometimes there are additions that have been started and then left. I am always wanting to sell the house, to be rid of it. But, there is so much work to be done on it that I know I can never get it to a fit enough state to be able to put it on the market. I am overwhelmed by it. I wonder what all that means? I had a couple of extra weird ones just lately. I dreamed I was on a flight. I dream this quite often too, but this time there was something wrong. We were getting lower and lower until I could see houses rushing past, but the odd thing was the houses were only inches from the window. I remember wondering how this could be because of the width of the wings. We eventually came to a standstill and the pilot came back to speak to us. He said it was his first flight and he would be in trouble now as he had buggered it up. Then everyone was getting off but I was looking for my hand luggage and by the time I got off everyone had gone and I was on my own. I found myself walking along East Ham High Street (where I grew up). I was heading towards the place I used to live. I heard a noise and up in the sky was the USS Enterprise taking off. I remember thinking in the dream that this couldn't be real. So, I sort of shook myself and stared at the sky. Yep, there it was, slowly getting higher. Last one. This was the weirdest I think. I dreamed that technology was such that if you wanted a baby, then the norm was to order one online. You could say what gender, colour, hair colour, eyes etc you required and then order it. The baby arrived by mail, but when it arrived it was in a sort of suspended animation. It was in a type of cocoon. Now you could keep it like this as long as you liked but once you wanted it to be a live baby you had to unwrap it and revive it. In the dream I got one of these babies. I can remember reviving it and it waking up. My next thoughts were not about "was it the right gender, or did it have the right colour eyes." All I could think was, "I hope I got a happy one." Anyone who knew my son as a baby will understand why I was most concerned about this. Finally. My mouth is absolutely no better. It is driving me insane. I cannot describe it to you. I contacted the oral surgeon who confirmed there is no treatment. I am currently pursuing alternative meds online but will see my doctor as it is now making me depressed. This has been a long, difficult winter...and it goes on..and on ....and on... We have been pretty miserable for the last few months. Philip is still totally stressed out at work, our Vegas vacation is on hold for the time being (due to his work commitments) and we have both been poorly with various illnesses. Some years ago we made friends online whilst playing an online game....World of Warcraft. We used to have some real laughs and got together, online, often. We even had headphones so we could talk to each other whilst our characters died in one or other dungeon. Lots of fun. A couple of these chums I have kept in touch with. They live in Michigan, which is about a 5 hour drive. Anyway, a couple of weeks ago I got an email saying that they were coming to Milwaukee to see a concert and did we want to meet up. We were a little nervous. The only reason we didn't offer to put them up overnight was that, although we felt we knew them, we had never actually met. We might not get on at all. They (or we) might be weirdoes. On Sunday we met them for Sunday brunch. We had the best time we have had in months. Gary came too as he used to be part of our gaming group and knew them from online. Above is Marc. I think the restaurant wondered what hit it. It was a riot. Our waitress took it all in her stride. The other diners were enjoying the fun too. Marc is a magician. Part way through the meal he started eating a paper napkin...then he sort of coughed and produced this, seemingly, never ending stream of garland from his mouth. Look at Philip laughing. I haven't seen him laugh like that in a long time. It was fab. We both really needed this. We got on so well, I really didn't want it to end. They, of course, had to get back to Michigan. But, I have told them they are very welcome to stay with us any time they visit Milwaukee. Turns out they loved Milwaukee, had an equally fab time and are coming back in July and staying with us. After both being a bit worried about eventually meeting face to face, it was great that it turned out so successfully. I have been treating my sore mouth with stuff from the doctor. Hasn't helped at all. Now I am using a hydrogen peroxide rinse to see if that will help. It is really getting me down. Ever since I had oral surgery I have had a really sore tongue. It feels like you have burned your tongue. I thought it must be something to do with the dental stuff so I thought it would go. I saw my regular dentist about a couple of weeks ago and mentioned it to him. He could see nothing wrong and suggested I had 'Burning Tongue Syndrome'. I still didn't take much notice but it is really beginning to get me down. It doesn't sound like much, I know, but it is a horrid feeling with a nasty taste in the mouth too. You find yourself being able to think of nothing else. Eating is a bit of a problem as well. Anyway, I did some research. I found there are lots and lots of people with this same condition. All of whom are searching for an answer. Some have had it for years (horrible thought). Some suggested baking soda rinses and using baking soda toothpaste. My dentist actually suggested this last one too. This eases it a little for a while but it is soon back. I then found a trend in a lot of the forums. Going gluten free. 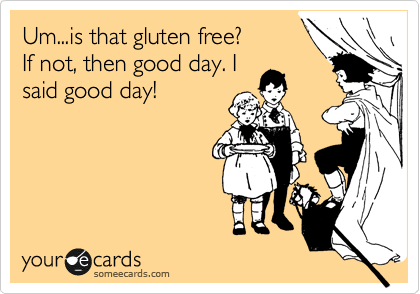 I know a couple of people who are on gluten free diets but not for this reason. I have never paid much attention to it to be honest. Anyway, this gluten free mallarky cropped up more and more. So, I decided to give it a go. Philip is also keen to try it too as one of the other effects is losing belly fat. It isn't for the faint hearted though. We went shopping today and the gluten free stuff is terribly expensive. I bought things that weren't too much more but I draw the line at paying $6 for a small loaf. It will be easier for Philip as meat is gluten free anyway. I did find pasta, crackers, polenta and a few other things but I think I shall have to start cooking totally from scratch. I didn't realise all the hidden gluten........soups and anything thickened with flour. I do cook a lot of our food anyway but I will have to do even more. I am going to look for bread recipes using gluten free flour. Then at least I can maybe make 2 or 3 loaves or several rolls for the price of one small loaf. This is going to be an interesting experiment. We are going to give it a month and see how it goes. If it doesn't work, then at least we tried. On Saturday we decided to get a take away from Outback Steakhouse restaurant. This was because I really fancied a blooming onion. 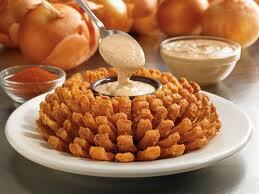 You can only usually get these at State Fair in August but I had recently found out that Outback did them. We don't like eating at the restaurant as it is very expensive but the take away menu was pretty good. So, we ordered the blooming onion (enough for about 4 really), stuffed mushrooms and Philip had a posh burger and chips too. The onion was disappointing, to say the least. It was so heavily salted that I couldn't eat it. I shall have to wait for State Fair to get a decent one. Oh well, it will taste all the nicer for the wait. However, it was not as disappointing as the stuffed mushrooms.....this is what we found when we opened the box. Doesn't really look like $8 worth does it? It actually made me laugh out loud....so I had to take a picture. We won't be getting any more grub from them anytime soon. The weather has been eventing yet again this week. For heaven's sake it is MARCH surely we could get a break now. Nope....another big snow storm hit again on Tuesday. This meant work was out again for me on Wednesday. It keeps Merv busy though. I saw him doing this just before the latest storm hit. The silly old sod is up a ladder in these conditions. Of course it was a waste of time as we got loads more snow soon after. No one else does all this stuff. It does keep me amused though. When I can't go out, watching Merv pratting around is all the excitement I have. After this latest lot of eventing......his roof was covered in snow and he had lost his hole again. Poor Merv what with finding his hole and the snow plough covering it up again - he was in and out like a fiddler's elbow. Dear Merv....your madness keeps me sane. This morning I am going to try to get to the mall. It looks like the sidewalks are clear. I have now come down with a case of cabin fever and need to get out. I have been reading about all the walks, trips to London etc my chums have been doing and it gives me the hump. This morning Sherpa Banks is attempting the North Face of Southridge Mall. I got trolled on my facebook page over the weekend. This has never happened to me before so I was unprepared. I belong to a cat rescue page, where people share pictures of their pets, kids etc and also seek advice for issues they may have with their pets. We have become friends and some are on my friends list. Anyone who is on facebook knows that from time to time people share pictures, jokes, cartoons etc. These come from your friends who are on your list and who you have decided to allow on your newsfeed. From time to time, I get stuff that I am uncomfortable with....it might be pictures of abused kids, animals or maybe even something I find offensive. There a brilliant little button that lets you hide such stuff. If it persists you can remove that person from your newsfeed but still keep them as friends. It just means that everything they share etc doesn't show up for you. Right...hope that explained things to those not involved in the glorious facebook community. I had put a mildly amusing picture on my page. Then I saw a comment from one of the cat ladies which accused me of putting offensive stuff on there. It was because the policeman in the picture was fat. Now....I had seen once before this person get very nasty with one of the other members of the cat rescue group for something very minor. Not, wishing to upset anyone, my first comment was one of apology ....although I did state that I still found it amusing. A few other people jumped in and said they too could find nothing offensive and that they had a good laugh over it. 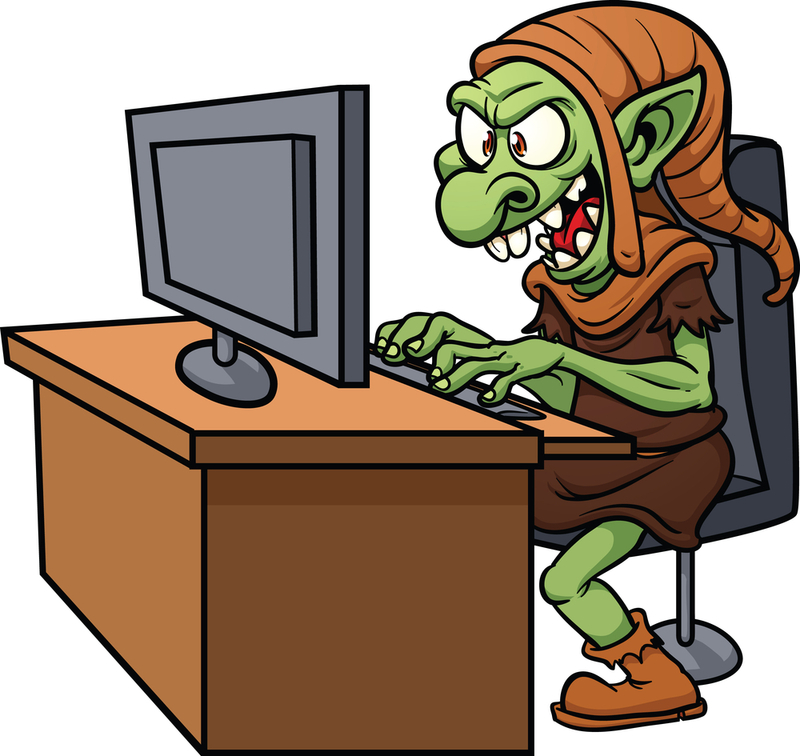 Ha....this is feeding the trolls.....see what I have learned. She then went right off her trolley and I had to step in and say 'enough'. Well, I had to say that ....in quite a few more words.........several times. She could easily have just hid whatever she found offensive....she chose to make a big fuss. Many of the other members of the group saw what she was doing and they were far from impressed. It finished with her being thrown out of the cat rescue group. It seems she had been in the habit of pulling stunts like this and people had had enough. She had been seriously offensive to a few of the ladies. Really nasty stuff. I never knew. I suppose it is because I tend not to get too involved in anything of this nature. I felt like I had been living under a rock or something. The amazing thing, well to me anyway, is that she claims to be a doctor. A psychologist no less. A case of "Physician, heal thyself" I think. I have heard others talk about groups of people with a common interest falling out. I wonder why this happens so much ?